Sewing room must be clean and organize well. You know, if you are in the middle working on something, and you can’t find thing that you really need, how does it feel? Moreover, it is sewing room. The sewers must know if they start to sew, the room will turn into a mess with cloth, tape measure, scissors, and other tools. So, all things must be clean and organize. Whether you are sewing as a hobby or your profession indeed, you have to put stuff fit the category. Well, here we will help you to give some of organizing sewing room ideas. What you have to do is make your room and table clean and tidy. It is a must. So you should separate the table. It means, if you need a table to measure the material or fabric or craft table, separating them with a table for other jobs. For example, if you need a computer in that room, craft table, and a table for a sewing machine, preferably, separates them. Craft table, a table for a computer, and a table for a sewing machine. If you only have a small room, you can combine craft table with a sewing machine table. However, try not to combine them with a computer. Referred to categorize sewing room ideas for everything is, the sewer definitely has a lot of fabric, whether it is a new fabric or fabric that has been used, categorize them. First, you can arrange the fabrics were in a drawer in accordance with the style, color, or in accordance with the type of project you are working on. It’s up to you, obviously, you have to arrange all of that according to what you want, and this sewing room ideas clearly done to facilitate your work. For the rest of the fabric pieces, you can put in a sealed container so that they do not look messy. Second, what if we put a thread, buttons, sequins, ribbons, and other small ingredients in a clear glass jar according to their colors? It makes thing easier to get the color you want. Third, you can use a pegboard to place the items you use often, items can be hung, such as gauge, scissors. Arrange them on a regular basis so that they do not look messy. What about of storage? In all rooms, storage is needed, especially, this room. So, the sewing room ideas are you will require more storage. Like where to put the fabric, the jar of buttons, threads jar, and others. Whether it storage is open, closed, or a combination of both. 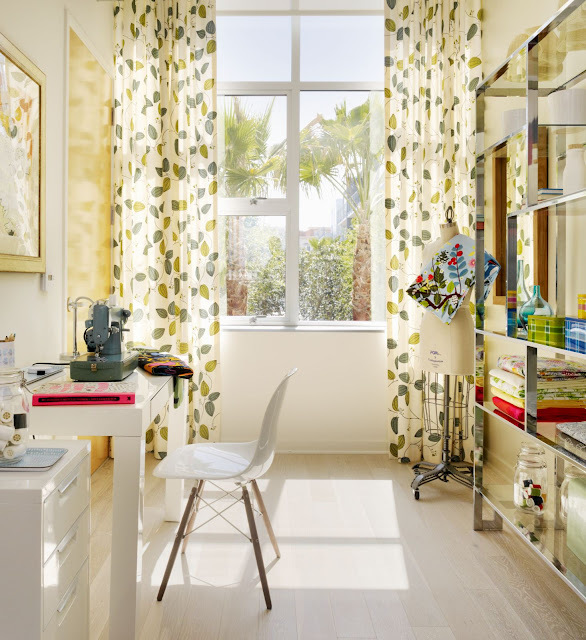 If you have a small room for sewing, use a corner or space that can be modified more functional. For example, you can use the back door of the room to hang a shelf that can be filled with various items. Or, you can use your desk to be used as a storage area. This sewing room idea might look messy, but if you are smart to arrange everything, it would be very beneficial. Like, you can put pencil cases on the table along with jars of buttons, sequins, scissors, or other equipment, in the side walls; you can put corkboard hang to hang designs or sketches, magazine clippings, or other.